Against my better judgment, Paul and I have submitted our application to do the Furnace Creek 508 again October 4-6, 2008. This year, instead of taking applications on a first come basis, they had us prepare a resume of ultra distance cycling and running accomplishments. They are going to accept people in on that basis. They sent an email and said they had a record number of applications. I expect that we will be accepted since we are 508 veterans (Paul also finished solo) and we both have a lot of ultra distance events accomplished the last couple of years, especially Paul. See this link to our website for last year’s event. Because of our trip to San Diego last week, I needed to get in a good long training ride today, especially considering the Devil Mountain Double is coming up in 2 weeks. There was no scheduled ride that had both the miles and the feet of climbing that I wanted so I ended up combing parts of one ride with another. At 5:30 am, I started biking in the dark (and a bit cold) to meet up with the Tierra Bella worker’s ride. They were doing the 200K route. Initially I was just going to do that ride but it was too short on miles (only 122) and the climbs were not tough enough for what I wanted. But I rode with them up Uvas, then down Bailey and back to Morgan Hill. The timing worked out great because I arrived in Morgan Hill just on time for a Nightriders ride that started at 8:00 from there. We planned to do a triple crown ride and four other riders joined me for that. We biked up the bike path, then climbed Metcalf. After going down the backside and then San Felipe, we made our way over to Quimby for our second major climb. It was now getting much warmer and I could feel the heat as we were nearing the top of Quimby. Quimby is a very steep hill and with only a double crankshaft, I was really torquing my leg muscles. Doug and I got to the top quick enough to have time to go down the East side and climb back up to the summit. Two of the guys had done a mega mountain bike ride the day before and it was too much for one of them, who headed back after reaching the summit. The four of us then descended down the East side and then up Mt. Hamilton Road to the summit. It was getting very hot now. Only two days earlier I had climbed Mt. Hamilton with John, but today it seemed much more difficult. I was glad to reach the summit where we had a break for awhile. Since the summit is over 4,000 feet, the temperature there was pleasant, but still warm. As we descended back down, we could feel the heat and as we climbed back up the East side of Quimby it was getting into the 90’s. We were lucky to have a tail wind on the way back, but I couldn’t seem to keep hydrated enough. Drinking hot water is not something I am anxious to do. By the time we got back to Morgan Hill I was very tired. Chuck gave us something to eat at his house and then I jumped back on the bike to return home. I ended up with 138 miles total and over 10,000 feet of climbing. 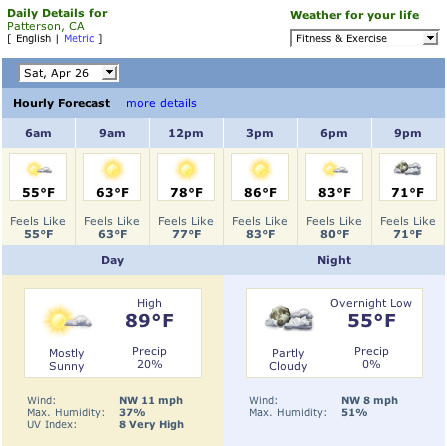 In many ways I felt worse than after the recent Solvang Double Century. I guess it was the heat, which hit the mid 90’s during the later part of the ride. After yesterday’s long 101 miles, I didn’t want to put in another long ride. Since I can’t ride tomorrow, I thought this was a good time to another speed workout. I did the same 20 mile course and after a warm up I did 7 minutes hard, then 3-4 minutes easy. I made a slight adjustment to the easy segments so the 7 minutes would be all without any need to turn a corner or come to a stop. I clearly have improved. This is a mostly circular course so the effect of the wind should balance out when looking at all the legs. Averaging the four legs, today I went 22.4 mph compared with 21.3 mph last month. 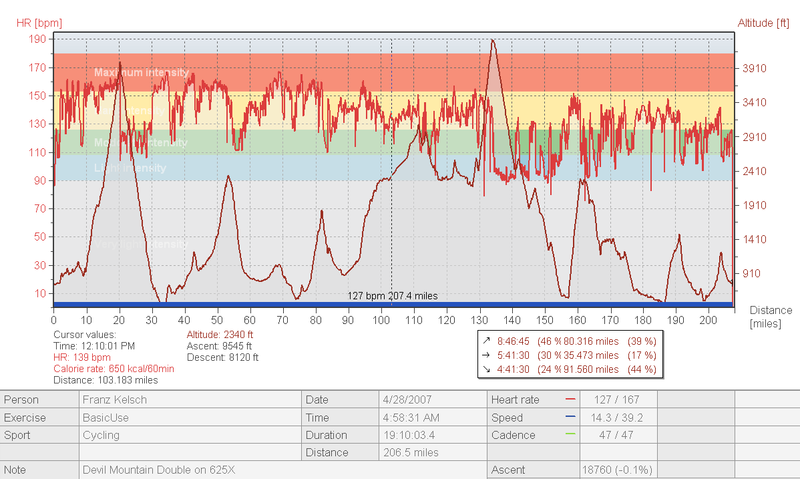 Both times my average heart rate during the intervals was 153. It may not sound like a lot but 1.1 mph improvement at that speed is a lot considering the increase in average speed was only a 5% improvement. But with cycling the effort, as measured in watts, is not linear. Using a formula to calculate, last month I was averaging 170 watts to get that speed while today I had to put out 193 watts, a 14% increase, while keeping the heart rate the same. In any sport a 14% improvement when you are basically pushing towards your limits, as a big deal. Here are the splits for today, April 4th, 2008 and from my prior interval workout on March 13th. One of the advantages of keeping lots of data in a training log is that I can look back at similar events and see how much I have improved. Improvement is not something that is normally associated with someone my age but in the cycling world I have been able to get some slight improvements over the past 7 years I have cycling. I belive this has come about because I lost weight, did a better job of training, and improved my cycling skills. These factors have combined to more than offset the effects of aging. From 2003 to 2007 I made only a 5 minute improvement in riding time, but took off an additional 20 minutes of stopping time. For the recent event, I took another 14 minutes off my riding time and even more off my stopping time. So from age 55 to age 60, I took off 1 hour and 19 minutes, of which 19 minutes was riding time and 1 hour stopping time. The non-athelete might think that such an improvement is not signficant. To average that additional 1.1 mph means putting out an additional 14% power when you look at the effects of drag and resistance. Anyone who does any type of sport knows that even a few percent improvement is hard to achieve. I am therefore pretty happy with the improvement I was able to achieve, while aging 5 years. For the recent Solvang Double Century we had 47 riders who rode it for time and all started together. This group was made up of mostly the fastest cyclists. Another 400 or so riders did not want to be timed. I ended up coming in 20th place amongst those 47 riders. I believe I was the only one over 60 in the entire group of 47 riders. They do not have age groups so I am not sure. The riders in that group just looked a lot younger than myself. 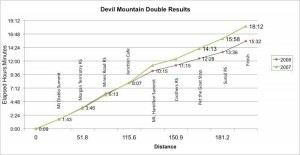 Another event I looked at was the Davis Double. I have completed it twice with these results. It is a somewhat more difficult ride than Solvang. I plan to ride Davis again this May and hopefully I can show some further improvement from last year. 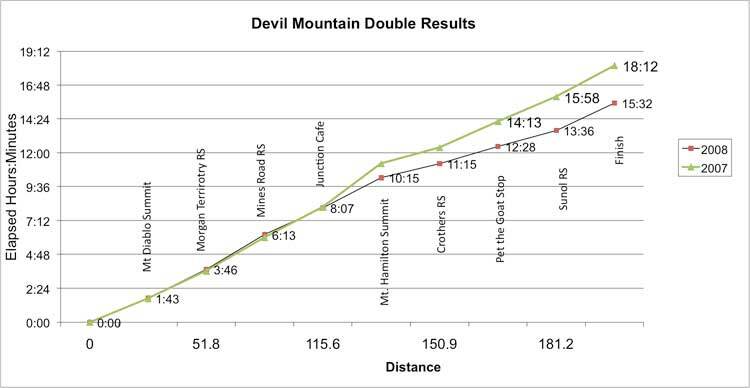 Before that I will be doing the Devil Mountain Double and hope to show a big improvement over last year when I didn’t do well.